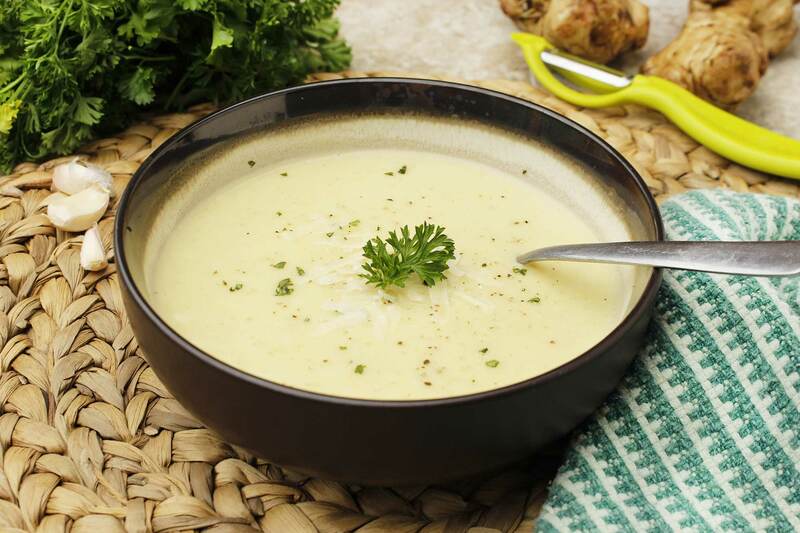 This soup has a lovely nutty flavor, complemented by the garlic and creamy potatoes. Leave out the Parmesan cheese to make it vegan. In a large soup pot heat the oil over medium heat. Add the onions and sunchokes, and sauté until the sunchokes are a bit tender, about 8 minutes. Add the potatoes and garlic and continue cooking for another few minutes. Add the broth, bay leaves, and sea salt. Bring the mixture to a boil then lower the heat to low, cover and cook until the potatoes and sunchokes are tender, 20 to 30 minutes. Remove the bay leaves and then process the soup in a blender or food processor until smooth. Season to taste with salt and pepper. Ladle the soup into serving bowls, sprinkle with fresh cracked pepper, grated Parmesan and fresh minced herbs.